Two 6-foot color-coded hoses with quick disconnects. The Basic can be upgraded at any time by purchasing any, or all, of the features of either the TTCF-6D Deluxe or the TTCF-7AR Supreme. 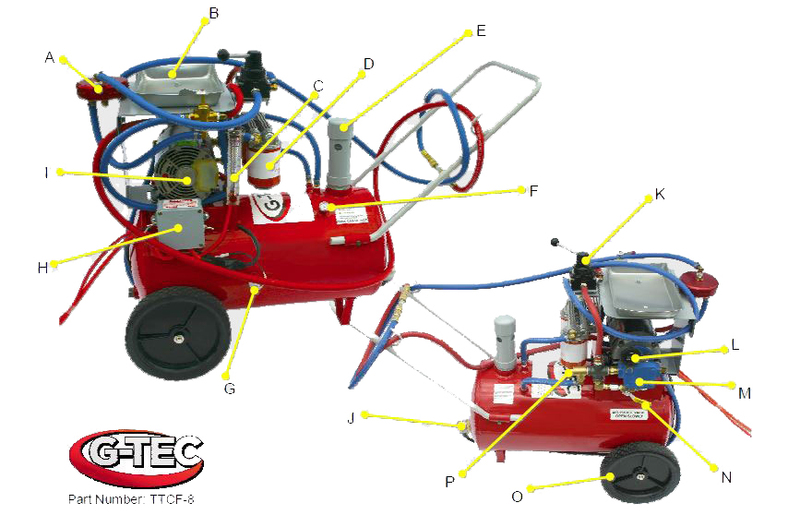 The TTCF-6D DELUXE, in addition to all the features included in the TTCF-6 Basic, has a 5gpm flowmeter, handle-mounted tool tray, and and ATF purge valve. The Deluxe will allow the user not only to clean the cooler lines but to do some diagnostics as well. Using the flowmeter the user will be able to check the flow of ATF thought the cooler system, check for restrictions in the lines, and determine when the filters need to be changed on the flusher. The purge valve will prolong the life of the flushing fluid and filters by allowing the user to purge off the first really contaminated fluid into an outside container. F-Tec also offers private labeling /customization on our Cooler Line Flushers. Please contact G-Tec for details. The TTCF-7AR SUPREME, G-Tec's Top-of-The-Line Flusher, has all the features of the TTCF-6 Basic and the TTCF-60 Deluxe plus a few very important brand new features. The Supreme has two checkable filter screens which are inserted into the two spin on filters to determine when all the debris is out of the cooler system. The Supreme also comes with an Air Purge System, or APA. 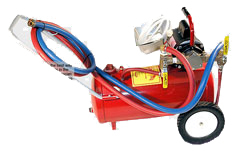 This system allows the user to purge with the air before flushing to blow debris out of the lines and a 5 or 10 second air blast during flushing will help clean the system faster, saving labor time. According to tests conducted by the American Honda Tool division, using the APA System reduced flushing time by as much as 75%. Finally, the APA can be used to clear and to dry the lines after flushing. The Supreme also comes with the Honda special fittings as well as our newly designed, deeper tool tray. The Supreme is currently the best machine for cleaning cooler lines. The G-Tec Heavy Duty Flusher is the newest addition to the F-Tec Line of heated cooler line flushers! It has all the features and benefits of the TTCF-7AR Supreme Flusher, however it utilizes ¾ hose, aircraft-style hydraulic couplings, 1" temperature gauge, 10 gpm flowmeter, full ½ hp motor, and larger fittings to accommodate Allison and International-style transmissions. This unit is truly designed for heavy duty trucks, buses, and industrial and commercial fleets. 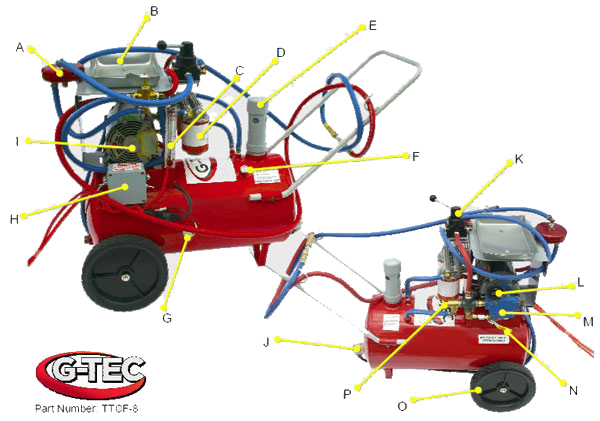 The G-Tec Fluid Exchanger is a complete transmission flushing and servicing system. The ATF fluid and servicing system. This ATF fluid exchanger is heated so that it can be used on all types of automatic transmissions from 4R100 Fords to 606 Chryslers. It is user-friendly and requires only four universal adapters to fit all styles of cars. F-Tec also offers a 48 piece kit containing 24 in-line filters with clamps and 24 bottles of transmission flush which will service 24 transmissions. 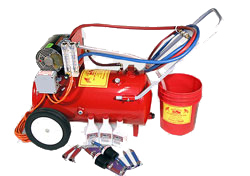 The G-Tec Fluid Evacuator is the best way to handle the task of moving fluids in the auto shop. 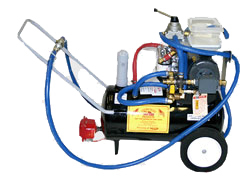 The Evac allows the technician to fill, drain, or transfer fluids from transmissions, radiators, brakes, power steering, engine oil, differentials and overflow tanks, or store the fluid in the 10 gallon onboard storage. 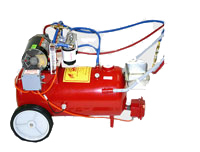 The Evac uses a ½ hp / 110 volt motor and pumps at a rate of 10 gpm. 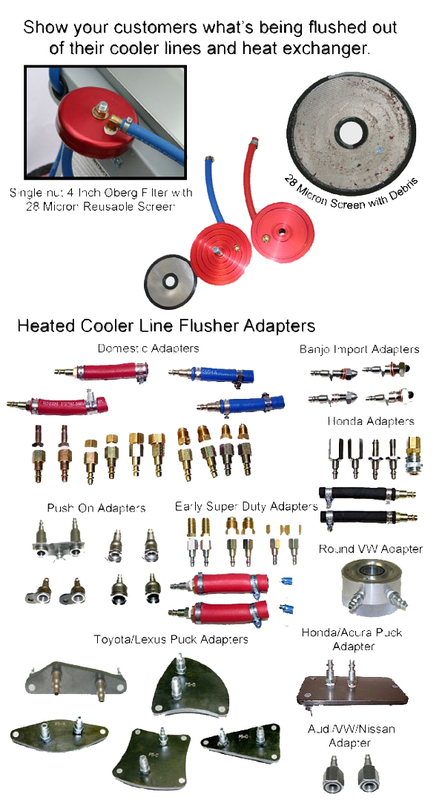 The wand adapters come in three sizes from 0.05 (dip stick tubing) to o.5 (common garden hose). There is an optional drain funnel and drain pan with casters available for the Evac. 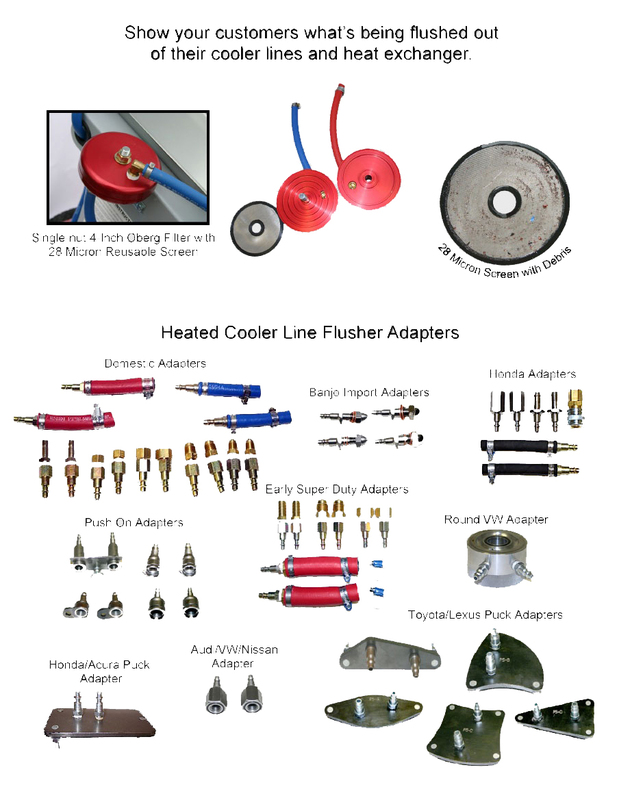 How does a heated cooler line flusher eliminate comebacks and mechanical failure? Every automatic transmission (A.T.) cooling system, whether it is an air-to-oil cooler or the new puck-style coolers must be cleaned when the transmission is overhauled or replaced in order to minimize repeat repairs - the dreaded comeback. G-TEC’s Heated Cooler Line Flusher is the most effective and economic method for removing contamination and debris from the cooling system.